The first trailer for Monster Brawl has landed and it truly made my morning. Not only does it feature some truly impressive makeup work, but if you're a fan of famous monster movies and/or pro-wrestling, it also brings some laughs. Monster Brawl stars comedian Dave Foley (Kids in the Hall, Despicable Me), wrestling icons Jimmy Hart - The Mouth of the South, Kevin Nash, revered MMA referee Herb Dean, Robert Maillet (300, Sherlock Holmes, The Immortals), Art Hindle (Porky's, Black Christmas) and the voice of horror legend and Call of Duty narrator Lance Henriksen (Aliens, Terminator). Regardless of how good it ends up being I think it's safe to say that Monster Brawl is a cult classic in the making. 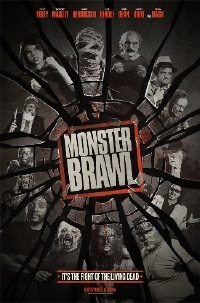 Watch the first trailer for Monster Brawl after the break! Damn can't watch till later! I had forgotten all about this one, Stoked! wheres the adams family hand? wow, this looks great, can't wait to see this on Syfy's sat night movie of the week.